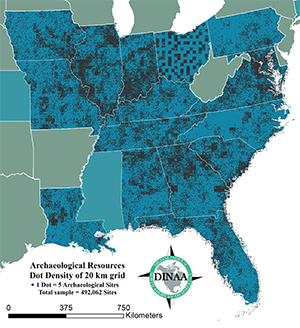 The Digital Index of North American Archaeology (DINAA) national archaeological database, developed by David Anderson and a number of colleagues, received enthusiastic endorsements from the presidents of the Society for American Archaeology, the Society for Historical Archaeology, and the American Anthropological Association. DINAA is directed to integrating or, more accurately, rendering interoperable archaeological site file data, while providing links to information about specific sites in other databases, collections, and publications using the formal site number as the common referent, or indexing tool. To date, information on over half a million sites from nearly 20 states have been compiled with the long-term goal of developing of a continental database and research tool to simplify obtaining archaeological information.